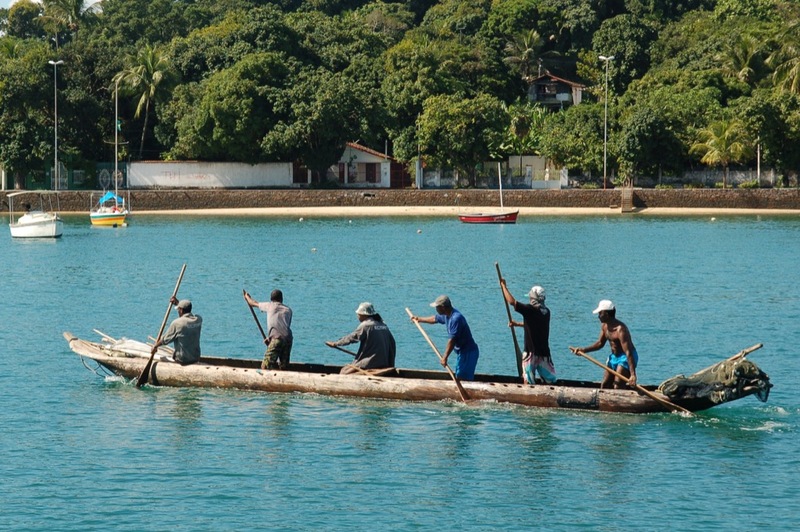 In our last article we introduced you to the dug-out canoes of Bahia. 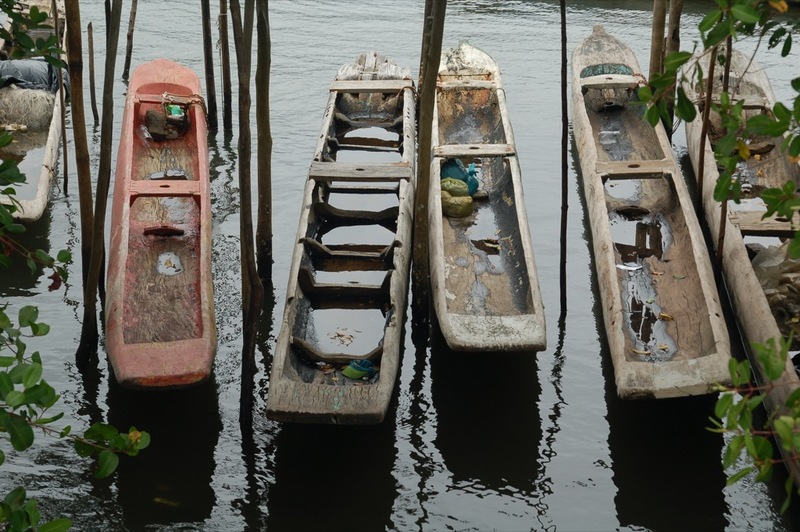 In chapter two of the story of Brazil’s traditional boats we show you how the natives have adapted their boat building methods to cope with modern legislation. 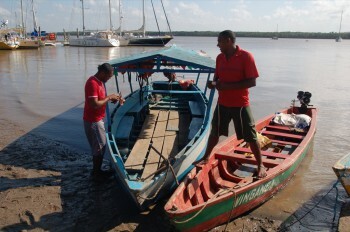 In the Bahia de Todos os Santos and in neighbouring Camamu the dug-out canoes are low and narrow – and slow. 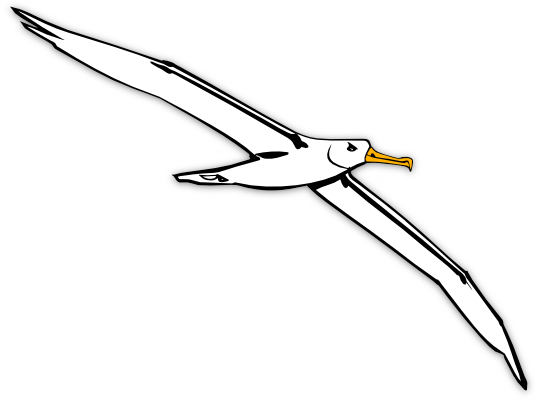 Even the bigger ones, which accommodate six fishermen, are relatively low and very slow. They are evidently very heavy. They were obviously carved from very big trunks, and when we walk through a forest I sometimes cast my eyes over the trees and wonder which sort is the most suitable. This old Bahian dug-out might be 100 years old. 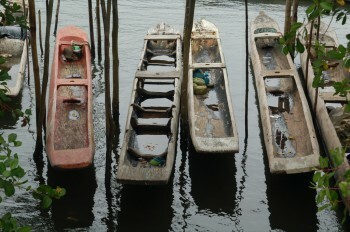 Whenever we ask the fishermen what kind of wood their canoes are made from they look a bit shifty – because they aren’t allowed to make dug-outs any more! – and then they rattle off a list of trees from which the canoes once used to be made. Since the words are mostly in the Tupi lingo, and since I wouldn’t recognise the trees anyway, most of the names go in one ear and out the other, but the one name which does ring a bell is jackfruit. The jackfruit tree produces a large, spiky fruit whose preparation and cooking is extremely messy and tiresome and whose taste is far from being sufficient reward for the ordeal – so that turning its provider into a canoe seems like a fitting punishment. 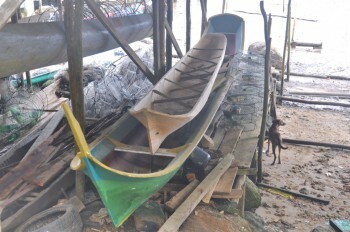 The old man told us that this canoe had been around for as long as he could remember. The adjacent photo shows the way in which these old dug-outs are kept going – with a new piece of wood bodged in here, and a tingle there – with the result that they can easily last for fifty or even eighty years. This one is being retro-fitted with stout frames which will hold the boat together as the timber splits. Note that one of these dug-outs has also been retro-fitted with frames. 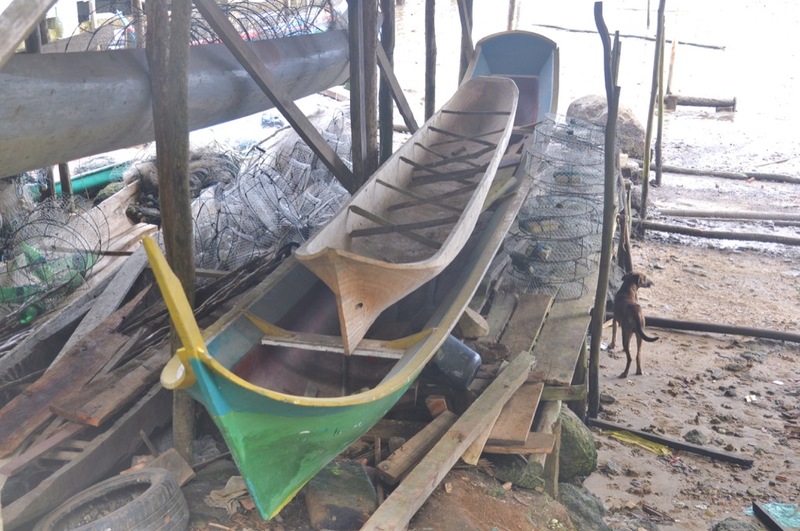 Hot sunshine is as much of an enemy as rot and boring insects, so that canoes left floating are as likely to survive as those lying on a dry sandy beach. 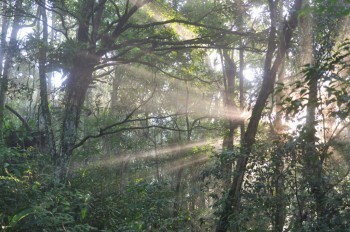 Nowadays in Brazil, as throughout much of the world, the felling of trees by anyone but an authorised logger is illegal. 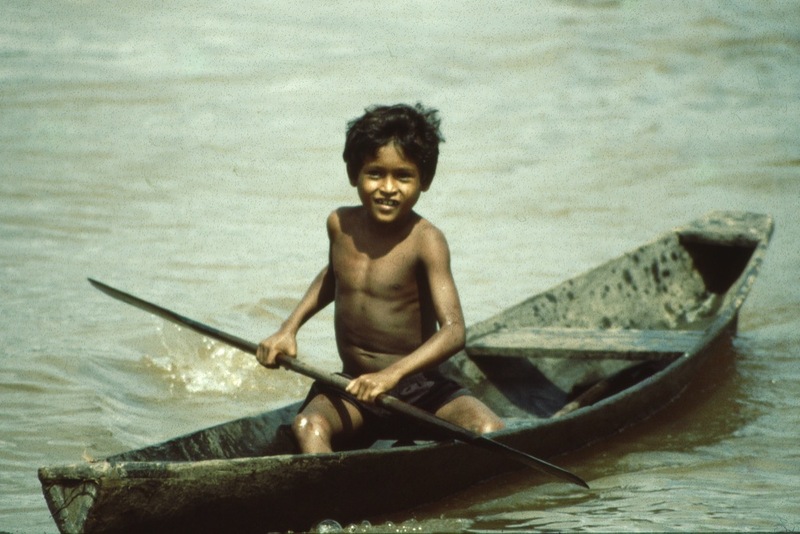 Besides preventing the ordinary people from going out to cut the timber from which their houses are constructed, this law also makes it pretty much impossible for them to build dug-out canoes – and it seems to me that this is rather sad. We are all well aware of the need to preserve the rainforest, but while the peasant folk of Brazil are denied the opportunity to craft their own boats in the traditional manner, their wealthy and super-wealthy comrades are nevertheless still permitted to cut, slash, burn, and fell to their hearts’ content. During the past few months deforestation has increased by 190%, we hear. 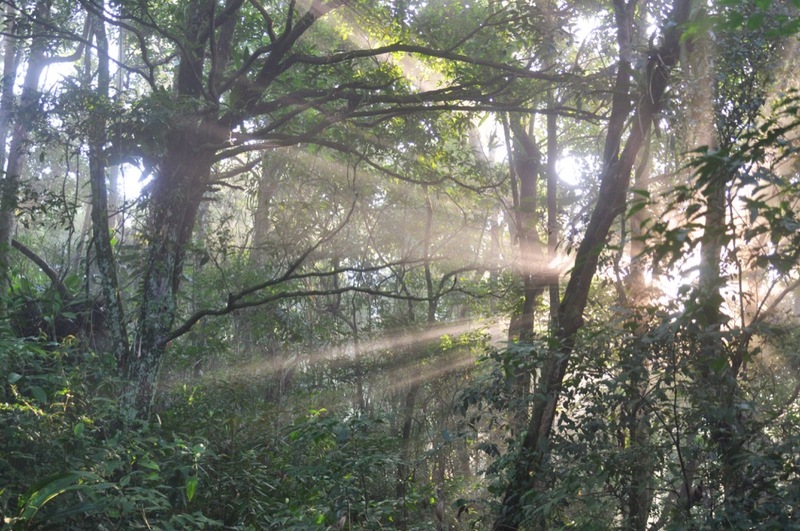 Brazil has refused to sign a recent treaty which would have meant ending deforestation by 2030; instead the country has a goal of slowing the pace of deforestation to 1,500 square miles annually (3,900 sq km). Just to put that in perspective – in the past 12 months 3,360 square miles of forest were cleared in the Amazon alone; and in the scant decade between 1991 and 2000, an area the size of Spain was converted to pasture land. None of the trees in this area of forest is stout enough to make even a small dug-out canoe. Besides being a giant carbon sink, which takes care of a large share of mankind’s CO2 emissions, the Amazon is also home to billions of species of plant and animal life, some of which are as yet completely unknown to man. So far as our environmental problems are concerned, every little helps – every person who abandons the use of his car, or gives up eating meat, or installs solar panels is helping to solve the crisis – and by the same token, every little “bad deed” is a further burden. But I’m not at all sure building dug-out canoes comes into this category. If they were allowed to continue their ancestral tradition, how much timber would the Guarani-mestizo folk use, I wonder? Perhaps as many as two lorry-loads each year? Two lorry-loads, or a hundred trees, amongst a population of 200 million people…? And whereas the loggers just hack away the whole forest, and then pass the land over to the farmers, the canoe builders would be selecting single trees and carting them out, leaving the rest of the forest intact. They might even be encouraged to plant replacement trees in the gap. It’s a difficult question, because we jolly well do need those trees. We need the young ones, and we need the big, old ones, too. And indiscriminate felling in the course of the past century has meant that there are actually very few big, old trees in the vicinity of the coast which are suitable to be turned into dug-out canoes. As it happens, the peasant folk do still make dug-outs, very occasionally. They make them in secret and in haste (sometimes they even use a chainsaw) and then they pass them off as antiques which have been in the family since Grandfather’s time. 1 – Those fishermen who just want the cheapest thing available buy a boat built from plywood. 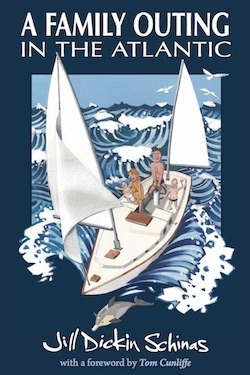 Mind you, it’s only cheap in the short term, because a knocked about knock-about plywood dinghy is unlikely to survive for more than 10 or 15 years. Unless the ends of the plywood are sealed and the hull well cared for the material invariably soaks up water and rots. 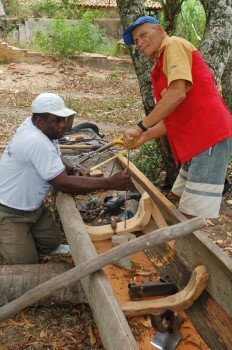 2 – Those folk who disdain the problems inherent with wood seek to buy an aluminium dinghy or a fibreglass version of the old canoe. Of course, fibreglass carries its own environmental problems – polyester and epoxy resin are plastics, derived from fossil fuels – and both aluminium and fibreglass are expensive; so this kind of solution appeals only to the wealthier fisherman. 3 – When it comes down to it, the majority of the men are still quite attached to tradition, and so they aim for the next best thing to a dug-out – which is a boat made from hardwood planks. Naturally, the planks have to be bought from a licensed timber merchant, who has the legal right to demolish the rainforest… but that’s just the way the thing goes now that the common property of all mankind is everywhere parcelled up, by the folks in power, and handed out to the highest bidder. 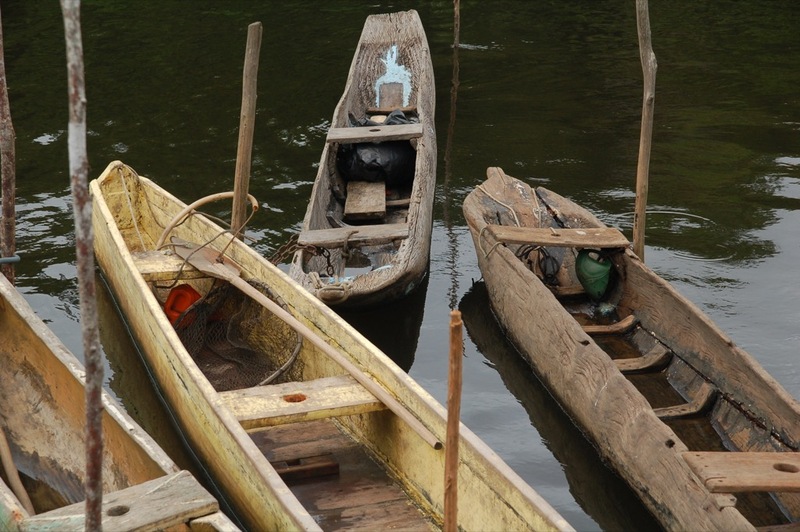 Since neither planks nor plywood are suited to the creation of a round-bottomed canoe the transition to the new materials has meant that the appearance of the boats has also changed, and it has changed in different ways in different places. Like the old dug-out, this vessel is principally a work-horse, its main use being as a fishing boat and a ferry. 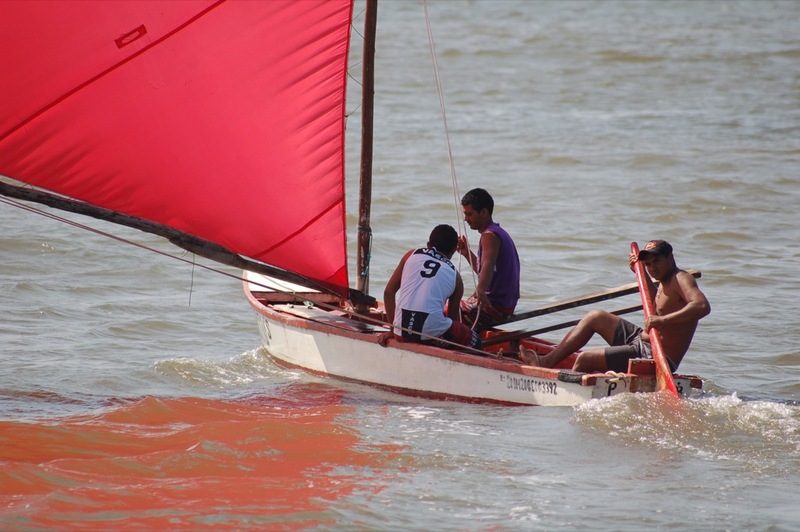 However, as we have seen, even a hollow log can be converted to provide a thrilling ride – it’s all a matter of how much sail you dare to cram on – and just as the traditional Bahian canoes can be made to fly, so too can the punt-like canoas. In fact, when rigged for racing, the boxy canoas of Jacare and Cabadelo are transformed into something reminiscent of an RS500. One feels that there is quite a lesson to be learnt here. 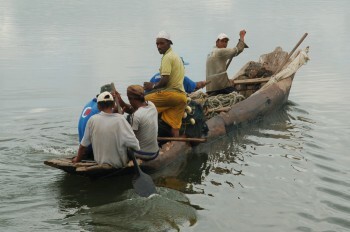 Whereas the rich kids of the Western world need state of the art carbon-fibre and mylar gizzmos in order to satisfy their adrenaline addiction, these peasant fishermen living in hovels on the edge of a commercial port get their kicks at little financial cost and with almost no environmental expense. The conversion from fisherman’s punt to racing machine employs one plank for a leeboard-keel, another couple of planks in place of trapeze wires, a pair of long bamboos for the mast and boom, a slice from someone’s cast-off spinnaker, and a paddle instead of a transom-hung rudder. They may not go quite as fast as the high-tech dinghy, but they are so insanely over-canvassed that these canoas provide just as much drama. 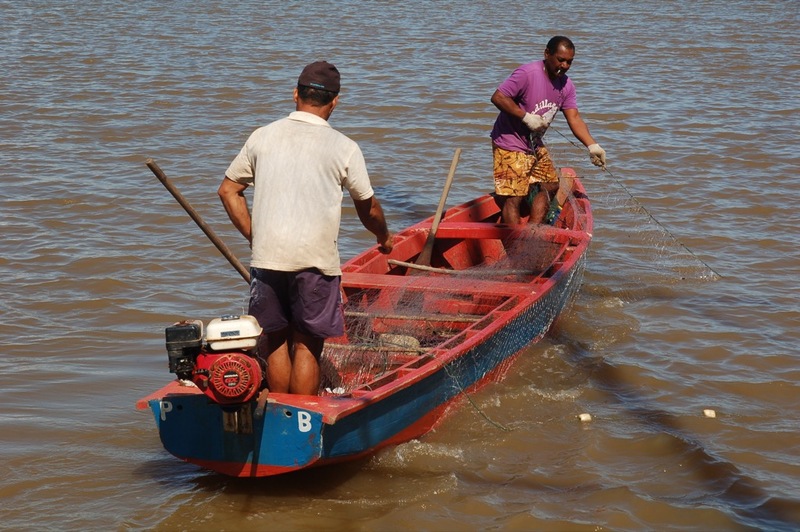 When we asked if we could have a go, the fishermen laughed. We may know better than they how to cross oceans, but none of us is fit and fast enough to flick to and fro, ballasting the boat on those moveable boards and preventing a capsize! 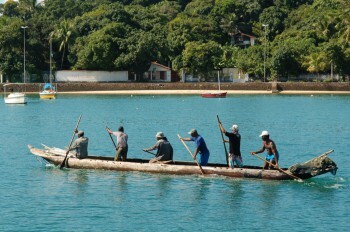 Heading south down the coast of Brazil one encounters other versions of the old dug-out canoe, but before we look at them I want to make a quick diversion to the north-eastern corner of the continent. 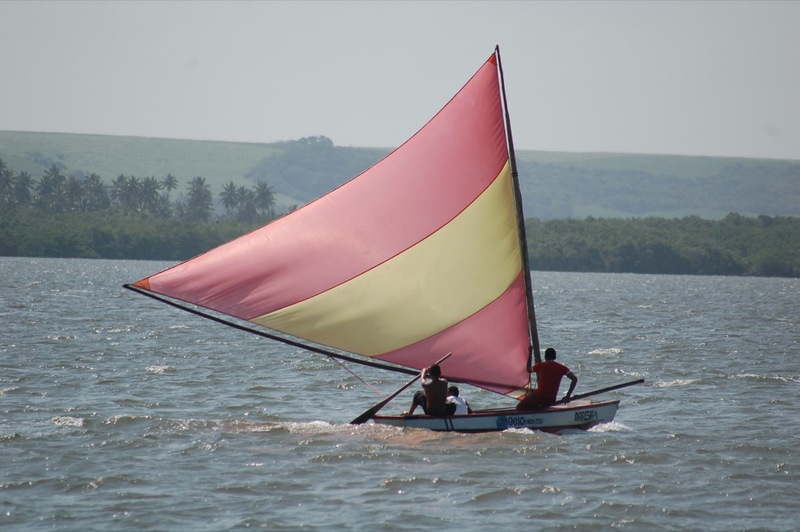 In Part Three of this series we will take a look at the sailing rafts of Fortaleza.